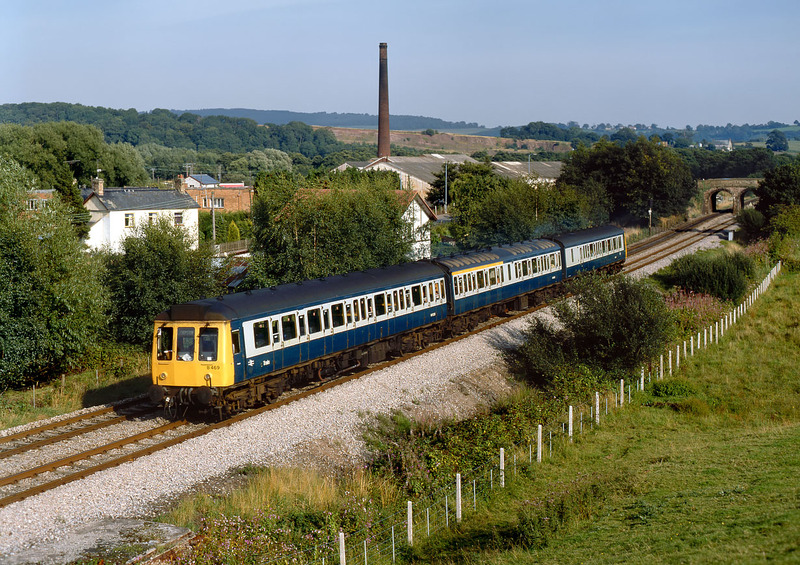 B469 (51326, 59479 & 51311) passes Ponthir on 4 September 1986 with the 16:55 Newport to Hereford service. Presumably this set had previously worked the 15:10 Cardiff to Chepstow and 16:05 Chepstow to Newport, which would explain why the destination blind still reads Chepstow! This is one of a number of Class 118 sets of which I only have a single picture, and there certainly wouldn't have been much opportunity to get any further pictures, as the set was disbanded a few months later. The two powered vehicles were withdrawn and moved to Vic Berry's yard at Leicester for cutting up, but the centre car managed to stay in traffic for a further year before finally succumbing to the cutter's torch at Mayer Newman's at Snailwell.